The newly rehabilitated MD 195 (Carroll Avenue) Bridge over Sligo Creek Parkway and Sligo Creek/spring 2017. Annapolis, Md. 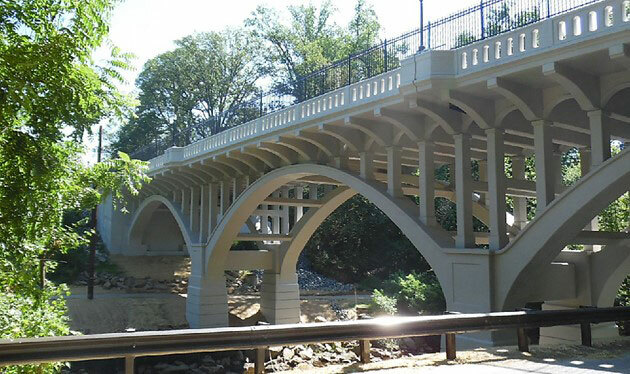 – A month ahead of schedule, the Maryland Department of Transportation State Highway Administration (MDOT SHA) recently completed the $12 million rehabilitation of the historic arch bridge that carries MD 195 (Carroll Avenue) over the Sligo Creek Parkway. The last of the cranes have been removed, the temporary bridge has been dismantled, and a freshly rehabilitated bridge is now in use by drivers, bicyclists, and pedestrians again in Takoma Park, Montgomery County. Under Governor Hogan’s leadership, Maryland is making record investments in highways and bridges. Of the 69 structurally deficient bridges inherited by the Hogan Administration, 41 have been rehabilitated, replaced, or are currently under construction. The remaining 28 are in various stages of design and are actively moving toward construction or repair. During construction, MDOT SHA used a temporary bridge to provide continuous pedestrian access to the Sligo Creek Trail. In this 2016 photo, the temporary pedestrian bridge is seen on the left side of the project. The historic three-span concrete arch bridge — which was built in 1932 — required extensive rehabilitation. Crews began work on the bridge two years ago, and closed it in July 2016. More than 46,000 vehicles travel this section of MD 195 daily. Closing and detouring MD 195 significantly helped the contractor complete the rehabilitation early and with as little disruption as possible to neighbors. In addition to the bridge rehabilitation, MDOT SHA’s contractor, Kiewit Infrastructure South of Peachtree City, Georgia, added new ADA-compliant sidewalks on the east side of MD 195 between Old Carroll Avenue and the bridge, upgraded sidewalks, installed lighting and improved the drainage system. The rehabilitation ensures the bridge will retain its historic character and can be used for another 75 years.